Hansen, who has been training in South Florida since late last year, will attempt to become only the second Breeders’ Cup Juvenile champion to capture the Run for the Roses. Street Sense, the 2006 BC Juvenile champ that won the ’07 Kentucky Derby, began his sophomore season with a victory in the Hutcheson Stakes at Gulfstream Park. Hansen is setting his sights on the Holy Bull Stakes next Sunday. He’s seeking his fourth consecutive triumph. The last Holy Bull winner to smell the roses was the ill-fated Barbaro, who lost his nearly year-long battle for life after coming up injured in the ’06 Preakness. Hansen debuted last fall at Turfway Park, breaking his maiden in a sprint. 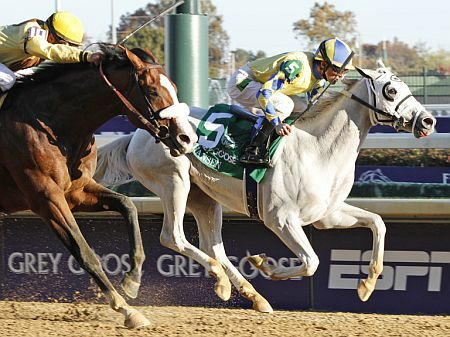 After posting a blowout victory at 1 1/16 miles in the Kentucky Club Juvenile, the son of Tapit won the BC Juvenile at the same distance in Louisville. The colt led at every call, defeating the favored Union Rags by a head. That gritty victory at Churchill Downs resulted in the Eclipse Award as champion 2-year-old male. Hansen has worked three times this year at Gulfstream, last breezing five furlongs in :59 4/5 on a fast surface Sunday. He’s among more than 50 nominations for the one-turn one-mile contest with a purse of $400,000. The field is likely to include Fort Loudon, who swept last year’s Florida Stallion Stakes for 2-year-old males at Calder Race Course, but finished seventh behind Hansen in the Juvenile. The son of Awesome of Course breezed five furlongs in 1:01 4/5 Friday at that South Florida track. Expected runners Algorithms and Consortium finished one-two on Dec. 16 in an allowance contest. Both colts by ’06 Preakness winner Bernardini, made their second career start after impressive debut victories earlier in New York. Algorithms wore down the favored Consortium in deep stretch for the length victory at 6 ½ furlongs. Consortium breezed five furlongs in 1:01 1/5 at Palm Meadows on Saturday. Others that may go are My Adonis and Tiger Walk, each with two triumphs, with both scoring at a mile. Union Rags, meanwhile, will run in the Fountain of Youth on Feb. 26. The son of Dixie Union has been training at Palm Meadows, an hour up the road from Gulfstream. On Jan. 18, he breezed four furlongs in :49 3/5. Hansen is a homebred for Dr. Kendall Hansen, a pain management specialist who gave away the colt’s dam, only to buy her back when trainer Mike Maker told him the horse was showing plenty of potential in his training. After a brief break from competition, Hansen was shipped to Maker’s barn at Gulfstream. Dr. Hansen, a onetime horseplayer based at Turfway, has indicated he’d like the colt to return to the northern Kentucky track for the Vinery Racing Spiral Stakes in late March. One of the traditional preps for the Florida Derby was renamed in ’96 for the great Holy Bull and has been staged at several distances since Home at Last won the inaugural in ’90 at 1 1/8 miles. This is the 23rd renewal. Last season, Dialed In won off an impressive maiden victory at Churchill Downs. He also captured the Florida Derby.